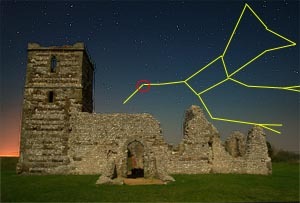 Knowlton Church is seen here lit by three-quarter moon, with The Plough, or Big Dipper, seen in the background. The plough is part of the constellation of Ursa Major - the Great Bear - and forms the tail and body (see right). The star circled in the diagram is a binary star (two stars in orbit around each other) that is visible with the naked eye. The fainter is called Alcor and is itself a binary. The brighter is called Mizar and is also a binary. Suprisingly the two that make up the binary of Mizar are also binaries themselves, in fact the fainter of them found to be three stars rotating around each other. This means the two that you see in the sky are actually seven stars all zooming around. The Alcor-Mizar pairing are known as the Horse and Rider in the arab world. You may have noticed a slight change to the blog today. Hopefully you can now remember your details when commenting, which will save you some time. Also, as I wanted to keep my photo archive somewhat separate from my blog, there can now be two wordy bits to a photo - one that describes the picture and one that is anything else of interest. If it looks a bit odd, you may need to CTRL-F5 to make sure the style-sheet is updated to cope with this new stuff. Let me know if anything is not working properly.